Chevalier Ramon Moreno - Grand Prior. Photo on the right: Grand Prior of the Philippines Chev. Ramon Jose Sebastia-Moreno y Ibarra is presenting the relics to the Chaplain of the Confraternity in Melbourne Fr. Manuel Sunaz CMF. More bishops and priest are joining the Confraternity of the Knights of St. Peter & St. Paul in our Grand Chapter of the Philippines. Bishop's Residence, Tabuk Pastoral Center, Bulanao, Tabuk, 3800 Kalinga, Philippines. Bishop Prudencio Padilla Andaya, Jr., C.I.C.M., DD was born on Jan. 2, 1959 in Lubuagan, Kalinga. He was ordained a priest on Dec. 8, 1986. Pope John Paul II appointed him Second Apostolic Vicar of Tabuk on April 16, 2003. He was ordained bishop on July 16, 2003. His installation took place at the same day. Currently, he serves as vice chairman of the Catholic Bishops' Conference of the Philippines' (CBCP) Permanent Committee on International Eucharistic Congress and member of Episcopal Commission on Missions. Bishop Andaya speaks English, Tagalog, Iloko and French. Picture: ​Monsigñor Anton Pascual and Chevalier Ramon Moreno - Grand Prior. We will be signing an Memorandum of Understanding very soon with CARITAS to be recognized as one of their official partners in feeding malnourished street children. As a living example of “making a difference in promoting the sustainable development of Asian societies”, Fr.Anton has been responsible in uplifting the lives of many through Caritas Manila and promoting good citizenship through Radio Veritas programs. When Fr. 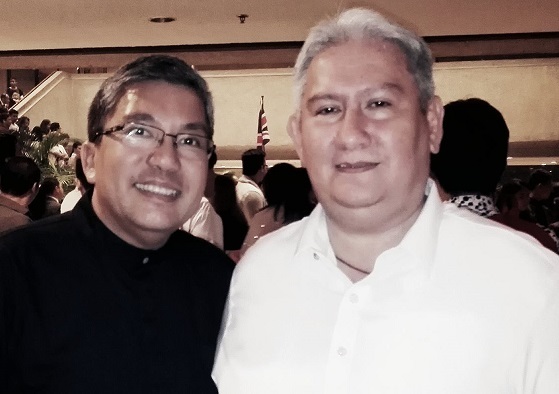 Anton CT Pascual became the president of Radio Veritas Philippines in 2005, he updated the vision and mission of the Catholic Church radio station with a clearer strategy for Catholic programming that directly serves the people’s moral and spiritual needs. Radio Veritas (Veritas846) became the most widely quoted radio station by broadsheets, and after less than five years under his leadership became one of the top 10 radio stations in Metro Manila out of 50. From 2010-2012, the Catholic shortwave station broadcasting to Asia was ranked number four. As the Executive Director of Caritas Manila since 2005, he pared down the leading church nonprofit organization in the Philippines to bare essentials, immediately eliminating inherited, recurrent deficits with a lean staff, rented or leased out underutilized Caritas properties, carefully targeted corporate and individual annual and quarterly donations in cash and in kind campaigns, and meticulously reported fund uses. Simultaneously, he organized the Caritas workers cooperative (the first in Southeast Asia) for middle-to-low income service professionals and workers for project-based contracts with Caritas partners. This solid management style impressed not only the Caritas Board, parishes and corporate stakeholders but also attracted counterpart Caritas organizations elsewhere in the world. His animated zeal provided systematic and significant assistance to Caritas Haiti after the earthquake in 2010, and Caritas Japan during the tsumani and nuclear plant leaks in 2011. These countries later sent study teams to Caritas Manila. His ability to influence also transformed fundraising telethons via Veritas 846 radio into the top-ranking “Caritas in Veritas” program, a platform for matching jobseekers and job hunters, scholarships and students, missing persons with their families. Fr. Anton also organized the Conditional Cash Transfer (CCT) program of the World Bank and its Philippine version, “Bangon Pamilyang Pilipino” (BPP - Rise, Filipino Families). He was invited to a Special Session of the Cabinet with selected invited congressmen and senators to explain his proposal. This led to a critical collaboration between Caritas Manila and the Philippine Government on the initial implementation of BPP. 60,000 poor Caritas Manila families were the first partner-beneficiaries of BPP, and the values education and micro-entrepreneurship program of Caritas. His deft use of media to teach and advocate has been recognized and admired. In 2010, Fr. Anton was the recipient of the Order of the Golden Heart with the Rank of Golden Cross from the President of the Philippines, the highest presidential award given to a Filipino (or foreign) citizen who has rendered distinguished services for the amelioration and improvement of the moral, social and economic conditions of the Filipino masses. 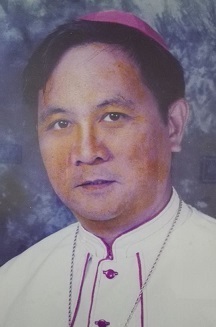 S. Antonio Roxas-Chua - Businessman, promoted Member of the Equestrian Order of the Holy Sepulchre of Jerusalem (EOHSJ), Phil Representative of RFL & Founder & Director of GTBB. Betty Go Roxas-Chua - Businesswoman, promoted Member of EOHSJ. Phil Representative of RFL & Founder & Vice Chairperson of GTBB. Vince Aranas - Dominican Brother, Custodian of the Pilgrim Image of Our Lady of Fatima, Director of RFL. Sr Lourdes Tayag, Dominican Sister of the Congregation of Daughters of St. Dominic, Director of RFL. Mrs. Lhou Tolentino, active Church Leader, BEC, Member of Legion of Mary, Director of RFL. Mrs. Monsie David, Community Leader, Director of RFL & GTBB. Mrs. Concepcion Brosas, Community Leader, Director of RFL & GTBB. Mrs. Marietta Reyes, Active Church Leader, Director of RFL & GTBB. Mrs. Doris Go Lee, Active CWL Member & Director of GTBB. Mrs. Julie Go, Director of GTBB. Those proposed below are businessmen and businesswomen who are actively serving in church and through their cenacle group. Dr Abelaine Abad Venida -Tablizo - Dermatologist.